With a new year starting, it is time for two customary types of blog posts: retrospectives and new year wishes. Here, I have decided to combine them both for you. Considering how much time I have spent looking at and talking about Kickstarter data, it would be a shame to miss the opportunity to join the crowd of analysts of the platform in giving my own take of the past year – with my usual focus on games in general, video games specifically. In 2013, there has been $477m pledged on Kickstarter, across close to 45,000 projects. About 20,000 projects got funded this way. Games represent the largest category on the platform, in front of Films, and by a large margin. 2012 was a remarkable year – it saw the Double Fine Adventure project put Kickstarter on the map for independent video game developers all over the world and the number of video game projects explode on the platform. From $1.2m pledged in 2011, Kickstarter went to close to $44m in 2012. 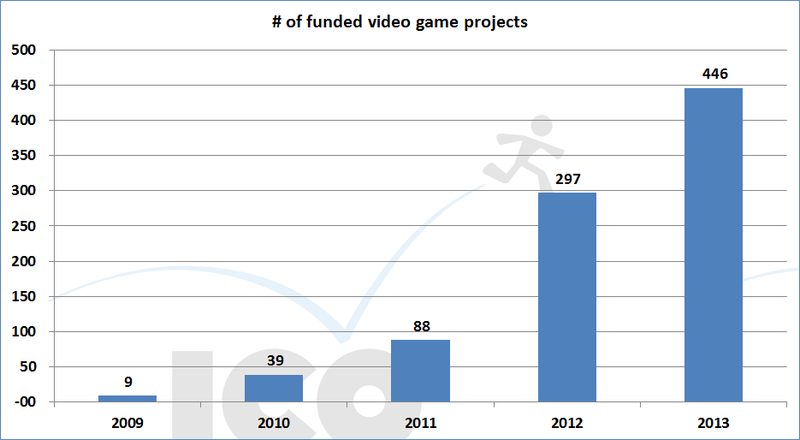 Throughout that year, a number of projects reached very impressive numbers for their funding and 2012 can be seen as Kickstarter Year One for video games for sure. So what about 2013? We saw that games as a category did very well, but you have to account for the fact that the category itself accounts for both video games and tabletop games projects. Yep, that’s right. 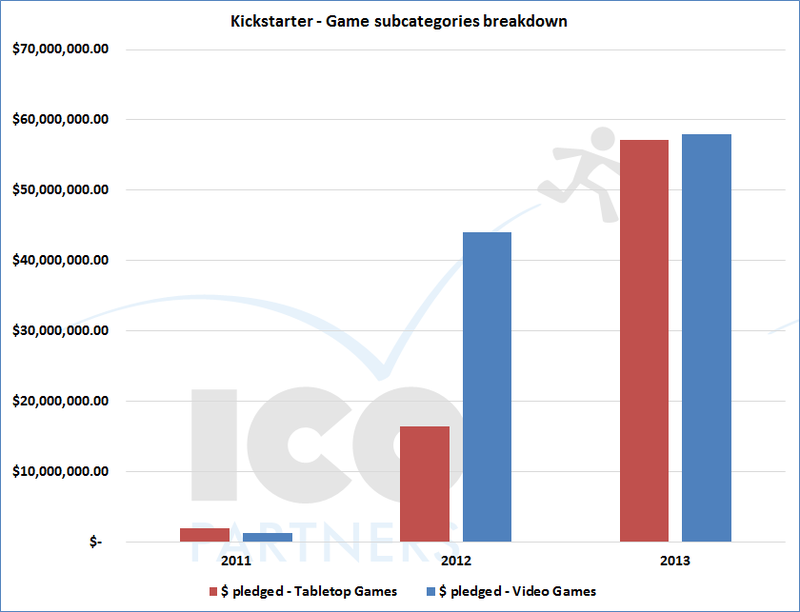 Tabletop games represent almost half of the money that was pledged for games on Kickstarter in 2013. Being a board gamer, it makes me incredibly happy. But more on this later, I will keep looking at video games for now. 2013 was to be a key moment – would the trend of growth continue and was it going to be steady? Or was there to be a collapse as the first large projects got delivered and a certain fatigue for crowd funding crept in? Purely looking at the total of money pledged for video games projects, it is obvious that 2013 was a better year than 2012. About 30% better. But such a snapshot can be a bit misleading – 2012 had a slow start with the Double Fine Adventure explosion happening after February. Looking at 2012 and 2013 month-by-month is interesting: you see that the end of 2012 and the end 2013 had almost the exact same volume of money being pledged. The difference between the two years mostly happens in the first half. It is not a big stretch to imagine that a plateau has been reached and that variances are created by the “hits” (post $500k projects). And, to be honest, I am less interested in those large project performance than I am by the potential of the platform for small projects. For Kickstarter to get a foothold in the game industry as a source of funding of interesting projects, we need to see projects of all kinds being successful on the platform. It is reassuring to see that a similar number of projects funded in 2013 compared to 2012, and a much better indicator to see if the model is sustainable. 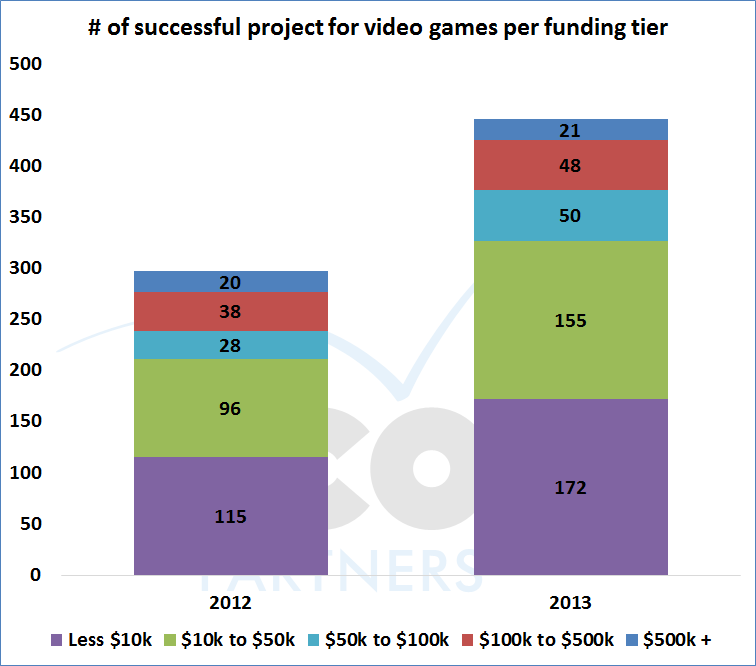 The following graph shows the number of successful projects per “funding tier”. The funding tiers are based on the amount of money the project raised and were empirically set by me. I think they represent meaningful tiers for independent games budgets. So basically, between 2012 and 2013, the number of $500k projects is essentially the same (around 20), but there has been 25% more projects raising between $100k and $500k. 80% more projects raising between $50k and $100k, 60% more projects raising between $10k and $50k and 50% more projects raising less than $10k. And to me, this looks like good news overall. 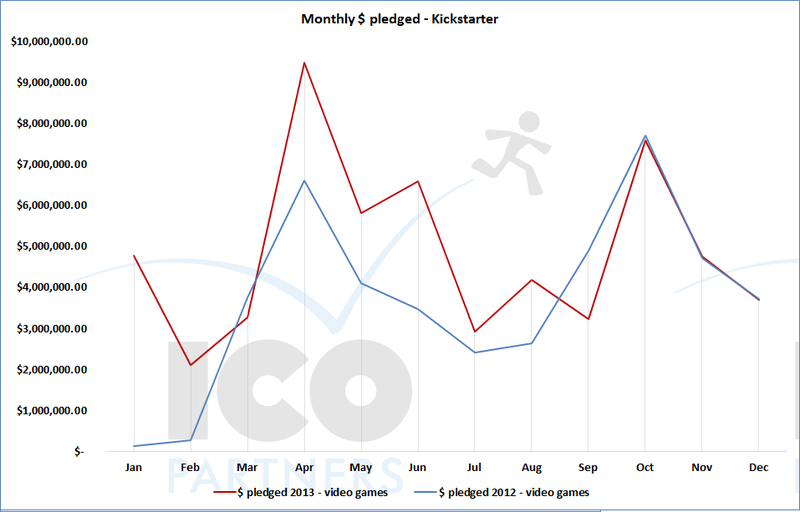 It shows a wider selection of projects can get funded via Kickstarter, and not just the very cheap or the very famous. I would be ok for 2014 to see fewer shiny, large projects if that would mean a larger number of projects found a way to get funded. I think this evolution stems from the development of a community of video game enthusiasts embracing the crowd funding principles. A growth from the bottom up sounds a lot healthier overall. It personally makes me very happy (and I did contribute actively to that category myself) as I love board games, but it also makes me wonder what video game projects creators could learn from tabletop game projects. The main problems their funding is to solve are fundamentally different. Video games have a high, fixed cost (the game development) and board games have a high, flexible cost (production and shipping of those games). That’s why the crowd funding works so well for board game as they can scale their main cost based on their popularity, a luxury video games don’t have. On the other side, video games have a lot of flexibility in the way they can deliver their projects and the way they can spread their development process over time – Double Fine and Revolution both deciding to deliver their games in two parts is clearly playing to that advantage. Aim for the smallest amount that guarantees you can deliver your project. Kickstarter is a platform that is perfect for projects that don’t aim for the moon, but promise a quality experience for the amount they ask for. I get to review a lot of projects on a regular basis from video games studios since I have started blogging about the crowdfunding of games – the vast majority of them are simply too ambitious and too expensive when considering the studio’s track record and its reputation. This is not the only point of failure there is, but this does seems to be the most common. So, if I have a wish for games on Kickstarter for 2014, it might be “be more humble, be more successful”. Special thanks to Potion of Wit for their help in the data-mining process. Oh, and I didn’t forget that I promised this blog to cover two purposes: have a wonderful new year, we wish you and your families all the best for 2014!